Muscle synergy is the neuromuscular strategy that allows the central nervous system (CNS) to deal with muscle redundancy. In muscle synergy, muscles which are activated in asynchrony, when performing particular movement, are grouped and controlled by low-dimension motor signal. The relationship between the neuromuscular strategy for behavioral adaptation to unfamiliar task in healthy human and recovering motor function after stroke is still unclear. Here we investigated the behavioral adaptation of six healthy participants who were introduced to unfamiliar task and we compared their resulting synergies with those observed from three stroke survivors throughout their recovery process. 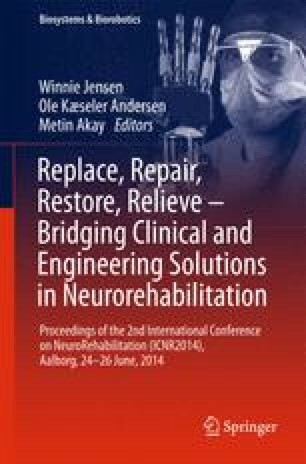 Our results revealed that the dimension of the resulting synergies of the healthy participants when introduced to an unfamiliar task was initially lower than the original; causing a restriction in the range of the joint motions and resulting in abnormal movements. The synergy dimension in those participants was gradually adjusted through behavior training. Interestingly, similar synergy patterns were also observed in cortical stroke survivors. This similarity in adaptation could be used to enhance the regular post-stroke therapeutic approaches by providing opportunities of testing various training protocols in healthy subjects before carrying only the efficient ones to the post-stroke patients.